Arahama and Natori area that used to be rice production areas are now not able to cultivate rice anymore as the entire infrastructure needed for rice production such as drains, gutters, and drainage pumps etc. were totally damaged by Great East Japan Earthquake in addition to the fact that salt contamination in the farm land is increased after the Tsunami. Commonly used countermeasure for brine damage is to inject pure water to the farmland to rotate soil so as to melt contaminated salt in the water to drain out of it with support provided by the Government. Nevertheless, this countermeasure is not working in Arahama and Natori area as most of the drain infrastructure are damaged. Under these circumstances, aiming towards disaster reconstruction and agricultural reactivation, we can plant salt-tolerant “cotton,” restart agriculture, and further prevent farm retirement as well as to provide employment for the farmers who lost their work. Some of the devastated farmers have shifted to cotton plantation. Cotton production and distribution has already been started by many apparel related companies who agreed on this reconstruction support project. 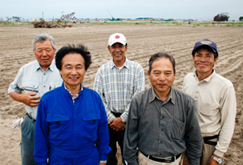 Tohoku Cotton Project is to provide “Tohoku Cotton Project” brand products that are planted, produced, and distributed by a TEAM of Tsunami devastated farmers and apparel companies. 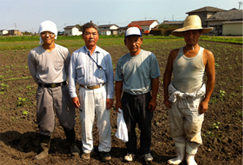 You can be a part of the project TEAM by purchasing products so as to cooperate supporting devastated farmers in Tohoku.